One week on the road. Our normal lives feel so distant, it is hard to imagine being anywhere but here. The desert grows more beautiful day by day. The rippling sand dunes are now covered with lush green vegetation. Recent rains have brought the desert to life. Two jet black eagles sit regally on a dune, watching us pass by. Their dark forms silhouetted against the red sand. Smaller birds twitter as they fly through the desert’s wild flower meadows. Flowers, grasses and small acacias populate the dunes, artfully planted it appears, as if to win a native garden show. The bleached tops of cane grass tufts sprout like whiskers on the banks of the dunes. Purple flowers blend with clumps of native spinifex. A solitary kangaroo hops slowly away then turns to watch us from his garden home. There is plenty here for us all, he seems to say. This truly is a botanist’s paradise. I lose count of the different species of flowers, shrubs and trees that we pass by. Bright yellow flowers dominate entire dune banks. From the viewing point on top of the higher dunes we see the desert garden stretching far into the distance on all points of the compass. Grey, green, yellow stripes on powder red sand. 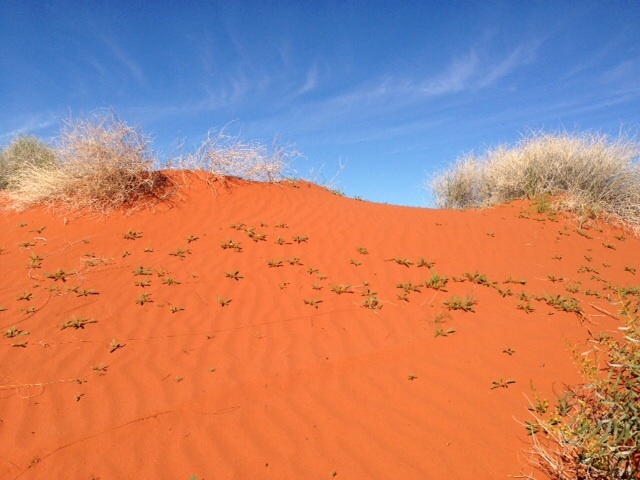 Look, a dingo, clearly visible with her blonde fur against the colours of the desert. She looks at us, tongue lolling from her mouth, then walks away. There is plenty here for us all, she seems to say. Food is abundant for plant, animal and bird life after the rains. As we drive towards Purni Bore, where we will eat lunch, we notice the land flattening. We are not yet out of the desert, but we are leaving her heart behind. We enjoy the luxury of a new shower and toilet block at Purni Bore and then drive on the flat pan, away from the dunes. The soft sand is but a memory as we travel on rock strewn roads through the flattest country. In the distance we can see the flat topped mountains of the Emery Range. Our tyres are soft. The pressure was reduced to drive better on sand. We now begin to grow concerned that the rocks may cause a puncture. As it happens, the only casualty is our sand flag, that flies away, heading back to the desert’s heart. We understand the desire to return. We drive forward on the rocky roads to Dalhousie Springs. The hot springs here are naturally created by water being forced up from the Great Artesian Basin that lies below us. This water is heated by high temperatures in the earth’s core and emerges at the surface at a comfortable 36-38 degrees. Time for a hot bath! We jump in and wash off the desert dust. Out of Dalhousie Springs the roads are corrugated and rocky. It’s is not a comfortable ride. We stop off for a brief respite at Opossum watering hole. A sign reminds us that this is a significant place for aboriginal people. The magical stories of the Dreaming converge on watering holes such as this that have been used for thousands of years. It is easy to understand why. Back on the rocky road, shaken but not stirred, we drive the last stretch of the day to Mount Dare. The red clay roads are deeply rutted. A final driving challenge before we camp and enjoy the hospitality of the Mount Dare Hotel. 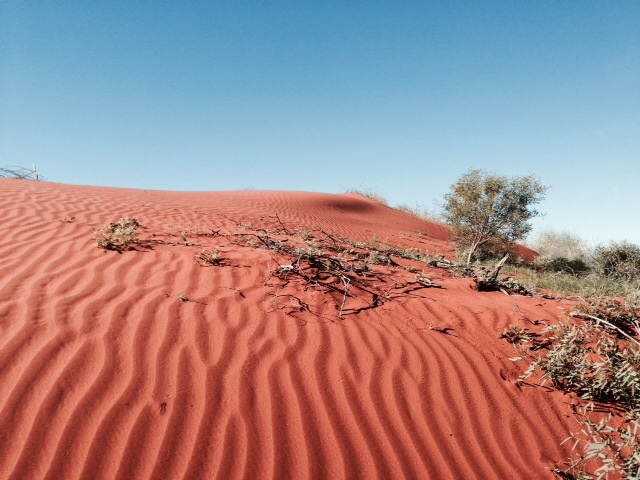 This entry was posted in Desert, On the road and tagged Australia, desert, Outback, Travel on 28/05/2014 by Deb McSephney. Evocative writing, Deb. You welcome your reader into your journey gently and passionately. A novel awaits!